Sen. Bernie Sanders speaking at a town hall forum hosted by Fox News in Bethlehem, Pa., on Monday. Amid the cheers Monday night for Sen. Bernie Sanders’ calls for a single-payer health care system and his verbal jousting with Fox News interlocutors over his tax returns, Bryan Callahan sounded a note of caution. “My concern is that President Trump has so inflamed the Democratic base that we will shift too far left and overreach like the Republicans did with the tea party in 2010,” Callahan, a Bethlehem, Pa., city councilman and self-described “lifetime Kennedy Democrat,” told Sanders at a town-hall style forum in Bethlehem. Bernie Sanders, making pitch to Trump Country, points to Erie, Pa.
Sanders (Ind., Vt.) said issues once dismissed by some as “extreme” when he ran for president four years ago, like raising the minimum wage and investing $1 trillion in infrastructure, are being “accepted by the American people” in his current campaign. The question looms over Sanders’ 2020 bid, as some Democrats wonder whether his nomination would scare off the kinds of suburban voters who helped deliver the party a resounding House majority in last year’s midterm elections. Those doubts help explain why Sanders spent the weekend campaigning in Pennsylvania, Wisconsin, and Michigan — three states that hadn’t voted for a Republican presidential nominee in a generation until Donald Trump shocked the country in 2016. Sanders, a self-described democratic socialist, has recognized a need to show that he can win in a general election against Trump and that far from alienating the center, his ideas resonate with the masses — and maybe some viewers of the president’s favorite television network. Even the venue Monday night was symbolic, set against the backdrop of the old Bethlehem Steel plant in Northampton County, which supported Barack Obama in 2012 and Trump four years later. “I think what he’s trying to do is symbolically convey, without explicitly saying it all the time, that he can win the critical states that Hillary Clinton lost,” said Bob Shrum, a former longtime Democratic strategist who advised the presidential campaigns of Al Gore and John Kerry. 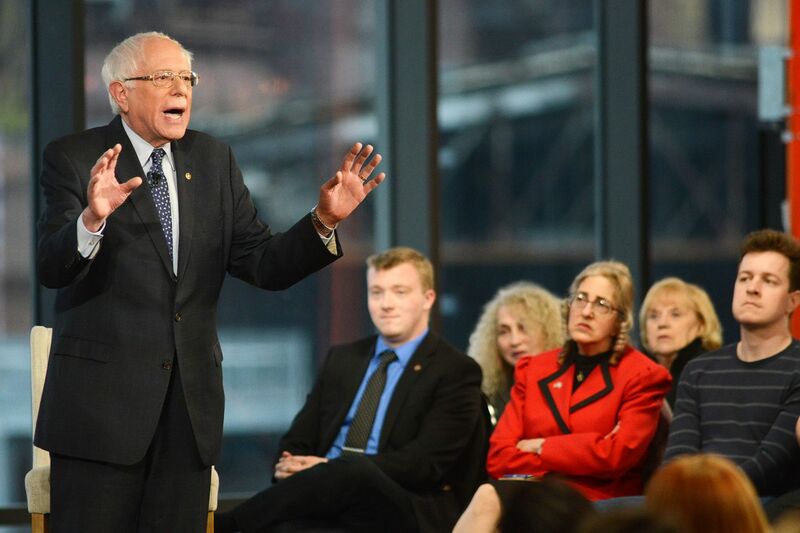 Sen. Bernie Sanders, I-Vt., takes part in a Fox News town-hall style event with Bret Baier and Martha MacCallum, Monday April 15, 2019 in Bethlehem, Pa.
Of course, merely showing up in Bethlehem doesn’t mean Sanders would actually have crossover appeal. And there isn’t a whole lot of evidence that Democrats need to nominate a fire-breathing populist to win Pennsylvania. After all, Trump won by less than 1 percent of the vote against a deeply unpopular Hillary Clinton. Barack Obama, John Kerry, and Al Gore all carried the state. Sanders’ swing through Pennsylvania came amid signs that the primary is heading toward a redux of the 2016 primary fight between Sanders and center-left allies of Hillary Clinton. Sanders sent a scathing letter over the weekend to the Clinton-aligned think tank Center for American Progress, accusing the group of smearing his campaign and questioning whether it had been taking cues from corporate donors. If any kind of Stop Sanders movement were to emerge on the left, the senator on Monday foreshadowed how he might respond. When a Fox News moderator noted that independent think tanks had questioned whether Sanders could pay for his broad transformation of the federal government, the senator hinted at a vast network of special interests that were bent on crushing his candidacy. Mirroring national polls, a majority of Pennsylvania Democrats say they would vote for the candidate they believe has the best shot at beating Trump, even if they disagree on most of the issues, according to an Allentown Morning Call/Muhlenberg College survey released last week. Just 30 percent of registered Democrats prioritized policy ideas over the ability to beat Trump, the poll found. Pennsylvania Democrats’ top pick right now is former Vice President Joe Biden (28 percent), who grew up in Scranton. He is expected to announce his 2020 plans in the coming weeks. He’s already making the case that a center-left Democrat like him is best positioned to win in the areas that handed Democrats the House last year. “Show me the really left, left, left-winger who beat a Republican,” he told reporters this month. It remains to be seen whether Pennsylvania will continue to get attention from Democratic presidential candidates. Most have focused their travels on the early nominating states of Iowa, New Hampshire, South Carolina, and Nevada. But with about 20 candidates running or likely to run in a primary that awards delegates on a proportional basis, Pennsylvania could play an important role when voters cast ballots in April 2020. “I think Pennsylvania’s position in the process may actually render it more relevant, not less, depending on what happens in earlier primaries,” Shrum said.